Nivenia corymbosa (Ker Gawl.) Baker, J. Linn. Soc., Bot. 16: 109 (1877). Witsenia corymbosa Ker Gawl., Bot. Mag. 23: t. 895 (1805). Nivenia stylosa Salisb., Trans. Hort. Soc. London 1: 311 (1812), nom. superfl. Genlisia corymbosa (Ker Gawl.) Rchb., Fl. Exot. 1: t. 24 (1830). 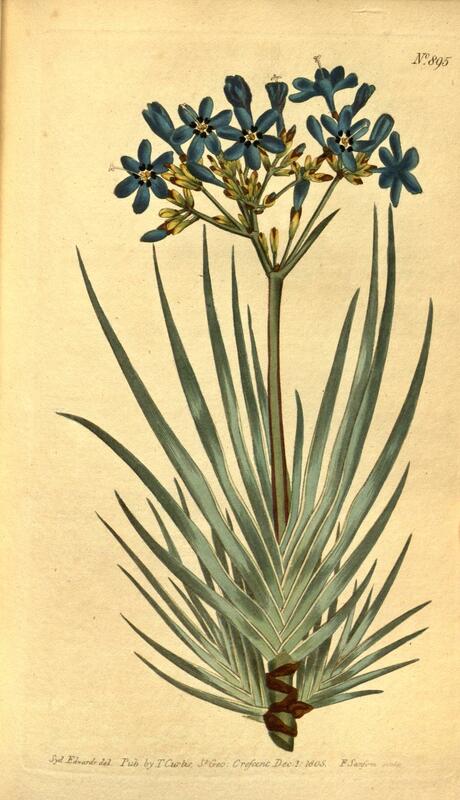 Aristea corymbosa (Ker Gawl.) Benth. & Hook.f., Gen. Pl. 3: 701 (1883). Nivenia filamentosa Salisb., Trans. Hort. Soc. London 1: 311 (1812).